In a series of posts, NAHB examined key housing statistics from the 2012 American Community Survey (ACS) for metro areas in the United States. One statistic that drew interest was the share of homeowners living in single-family detached housing. This post expands that analysis by looking at the share of total housing units (owned and rented) from 2005 to 2012. The share of single-family detached housing is calculated by taking the total number of single-family detached units divided by the total number of housing units. The share of single-family detached housing or single-family concentration gives a snapshot of the housing stock for a specified geography. At the national level the single-family concentration has changed very little in recent years. According to the ACS, in 2012 the concentration was 61.6% compared 61.1% in 2005. The small movement in the single-family concentration at the national level is not surprising. The U.S housing stock is aging. According to the latest data from the Department of Housing and Urban Development American Housing Survey (AHS), the median age of an owner-occupied home was 35 years in 2011. The median age reported in the 1985 AHS was only 23 years. Therefore, if the single-family concentration is not effected in large order by removing housing units, changes are instead the result of the growth in new construction of single-family housing relative multifamily housing. For example, an increase in the single-family concentration is the result of more single-family housing being added than multifamily housing. Conversely, a decrease in the single-family concentration is the result of fewer single-family housing being added than multifamily housing. Although the single-family concentration showed little movement from 2005 to 2012 at the national level, several metro areas did experience noticeable change. Metro areas with the largest percentage point increase in the single-family concentration from 2005 to 2012 are shown below. 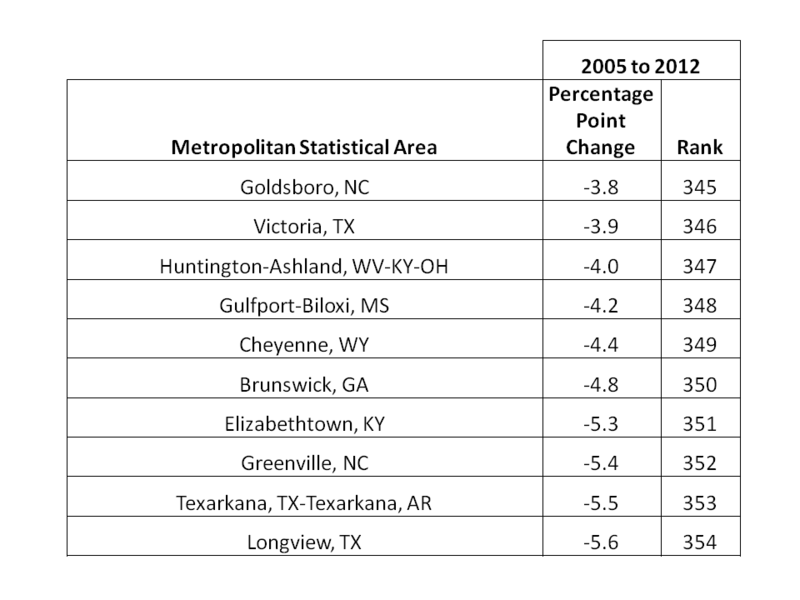 One trait shared by the metro areas in the top ten was above average population growth. 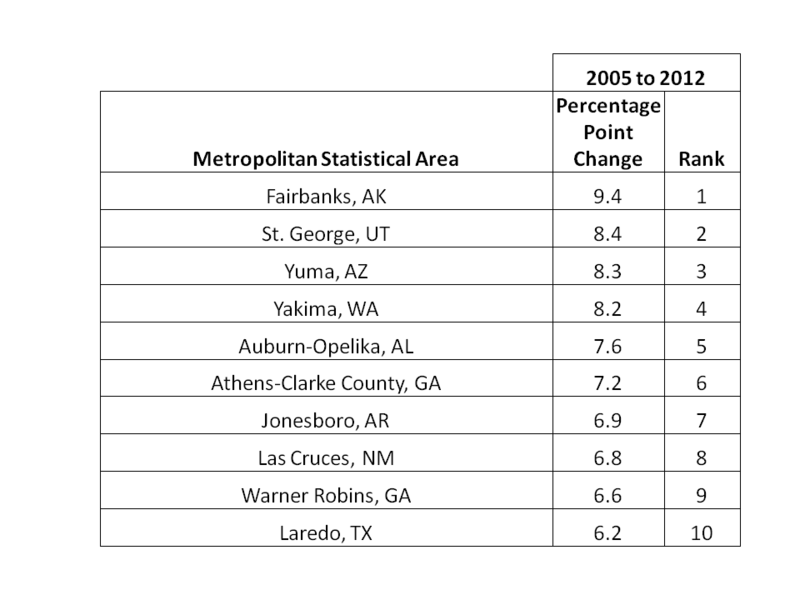 From 2005 to 2012, all metro areas in the top ten with the exception of Yakima, WA experienced double digit population growth. The population growth in Auburn-Opelika, AL during the time period was over 24%. Population growth alone cannot explain the large increases in the single-family concentration. Land use regulation and availability also play a role. Higher concentrations are typical of locations with less dense developments. 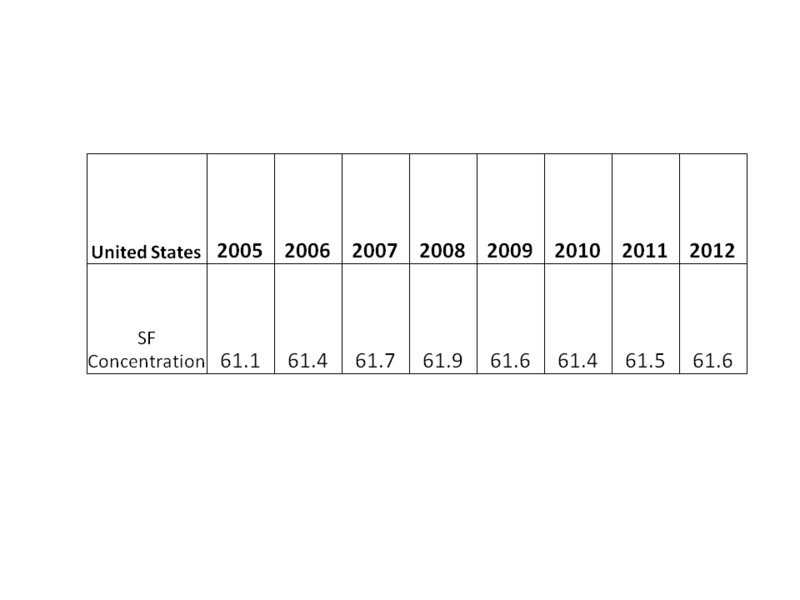 MSAs with the largest percentage point decrease in the single-family concentration from 2005 to 2012 are shown below. The metro areas in the bottom ten do not share the trait of average population growth. It is worth keeping in mind that population growth can produce a falling single-family concentration, if the growth results in apartments rather than single-family homes. For example for the list above, Greenville, NC experienced population growth over 25% while Victoria, TX experienced population growth of only 1%. Thus, land use regulation and availability play leading roles. Lower concentrations are typical of locations with denser developments. Although the national figures saw little movement from 2005 to 2012, certain metro areas saw noticeable movement. These figures allow us to examine the relative growth in single-family and multifamily housing units for each metro area. In a recent study, NAHB examines eight key housing statistics from the 2012 American Community Survey (ACS). This post takes a closer look at one of those statistics; the share of new owner-occupied units. The share of new owner-occupied units is calculated by taking the total number of owner-occupied housing units built since 2000 divided by the total number of owner-occupied housing units. The number indicates how fast the stock of owner-occupied housing is growing. The metropolitan area with the highest share of new owner-occupied units is Palm Coast, FL with 46.3%. The Palm Coast figure is well above the national share of new owner-occupied units of 17.0%. The metropolitan areas with the highest share of new owner-occupied units are scattered from Delaware to Utah. Three of the ten have a population greater than 1 million while four have a population below 200,000. The demand for new housing depends on factors including population and income growth. 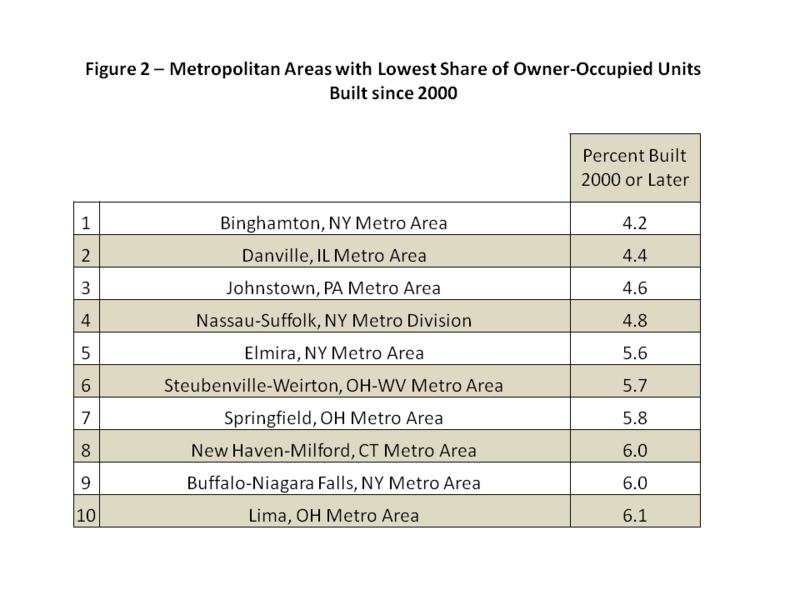 The metropolitan area with the lowest share of new owner-occupied units is Binghamton, NY with 4.2%. Four of the ten metropolitan areas on the list are located in New York. The relatively low demand for new housing in part reflects an aging population. The aging population represents a challenge for new home builders in these local metro areas but a significant opportunity of remodelers to meet the needs of a population with an aging housing stock. The complete series is provided below. In a recent study, NAHB examines eight key housing statistics from the 2012 American Community Survey (ACS). One statistic is the homeownership rate for all metropolitan (metro) areas in the United States. A metro area is an aggregation of counties that share a local labor and housing market based on commuting patterns. This post lists the ten metro areas with the highest homeownership rates and the ten metro areas with the lowest homeownership rates. The homeownership rate is calculated by taking the total number of owner-occupied units divided by the total number of occupied units for a chosen geography. Occupied units can either be rented or owned. Therefore, a high homeownership rate implies a low renter rate. 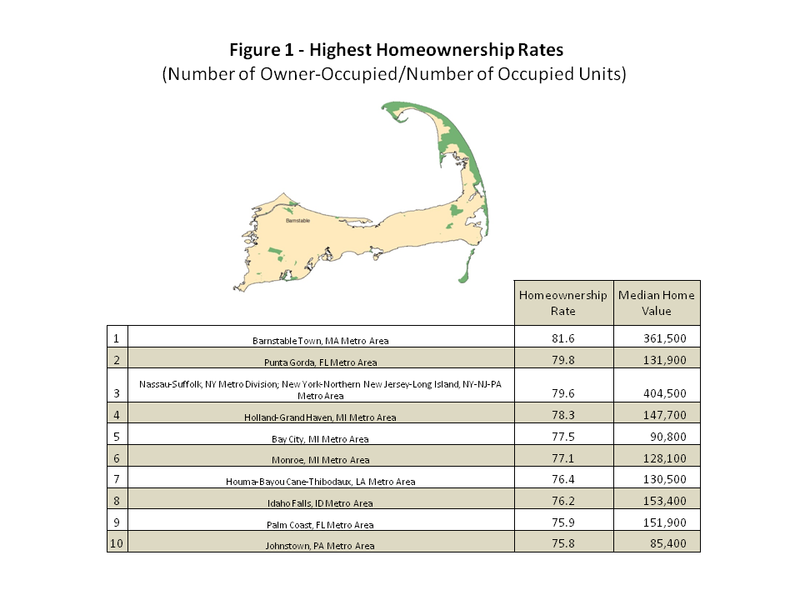 According to the 2012 ACS, the metro area with the highest homeownership rate is Barnstable Town, MA at 81.6%. The national homeownership rate during the same time period is 64.7%. The Nassau-Suffolk, NY, metro area is the only metro area in the top ten with a population less than 100,000. As one might expect, the homeownership rate is linked to affordability. In general, homeownership rates are higher when homes are more affordable. Eight of the top ten metropolitan areas have median home values below the national median home value of $171,900. 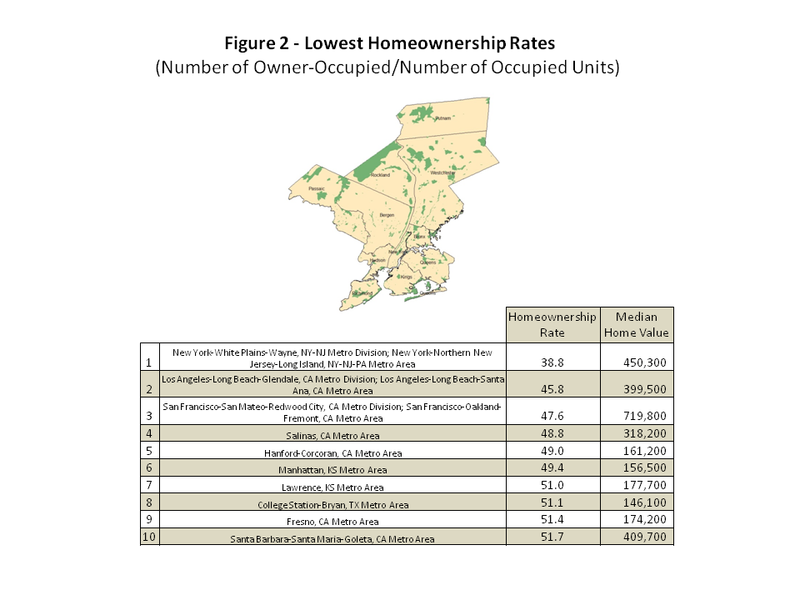 According to the 2012 ACS, the metropolitan area with the lowest homeownership rate is the New York metro division at 38.8%. The three areas with the lowest homeownership rates (New York, NY, Los Angeles, CA and San Francisco, CA) are heavily populated metropolitan areas with median home values well above the national figure. In addition, three of the ten areas with the lowest homeownership rates are home to large universities which place a heavy demand on rental units. Group quarters such as dormitories are included in the ACS which also pushes homeownership rates lower in these areas. The Manhattan, KS metro area is home to Kansas State University. The Lawrence, KS metro area is home to the University of Kansas. The College Station-Bryan, TX metro area is home to Texas A&M University. *** The ACS typically produces lower homeownership rates than other government data sources like the Housing Vacancy Survey (HVS). NAHB believes this is due to the extensive follow-up interviews conducted with the ACS which classifies fewer units as vacant and more as occupied (probably differentially owner-occupied), although the Census Bureau has not yet confirmed this assertion. The HVS is timelier but the ACS has more geographic detail. In a recent study, NAHB examines eight key housing statistics from the 2012 American Community Survey (ACS). The study allows readers to compare the statistics for all metropolitan (metro) areas in the United States. A metro area is an aggregation of counties that share a local labor and housing market based on commuting patterns. This post lists the ten metro areas with the highest count of owner-occupied housing units; the first statistic discussed in the study. As one might expect the count of owner-occupied housing units is directly related to population and the homeownership rate. Occupied units can either be rented or owned. Therefore, a high homeownership rate implies more owner-occupied units relative to rental units. 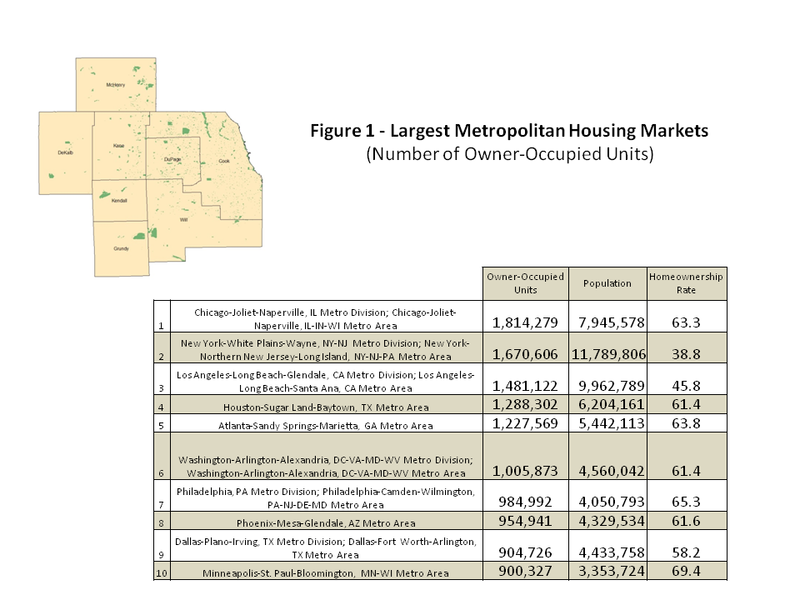 The metropolitan area with the most owner-occupied units is the Chicago-Joliet-Naperville, IL (Chicago) metro division with just over 1.8 million units. The Chicago metro division is the third most populous at just under 8 million. The Chicago metro division has a homeownership rate of 63.3% which is slightly below the national average of 64.7%. The New York-White Plains-Wayne (New York) metro division ranks second with just under 1.7 million units. The New York metro division is the most populous metro area. The population of the New York metro division is nearly 12 million. The homeownership rate, however, for the New York metro division is well below the national average at 38.8%. The Los Angeles-Long Beach-Glendale (Los Angeles) metro division ranks third with just under 1.5 million units. The Los Angeles metro division is also more populous than the Chicago metro division but with a lower homeownership rate. The homeownership rate for the Los Angeles metro division is 45.8%. The remaining metro areas on the list have both large populations and homeownership rates that approach the national average of 64.7%. The Philadelphia metro division and Minneapolis-St. Paul-Bloomington metro area are the only two metro areas on the list with homeownership rates above the national average. New NAHB Economics research shows that the share of young adults ages 18 to 34 living with parents or parents-in-law increased sharply in the late 2000s. According to the most recent American Community Survey (ACS), one in three young adults ages 18 to 34, or more than 24 million, lived in homes of their parents or parents-in-law in 2012. By comparison, the 1990 and 2000 Censuses reported that only one in four young adults ages 18 to 34 lived with parents at that time. The NAHB analysis shows that the biggest shift in the preferences of young adults to live with parents happened after 2005. This is particularly true for older young adults, ages 25 to 34, whose share living with parents was fluctuating around 12 percent from 1990 through 2005 and then quickly rose to exceed 19 percent in 2012 (see figure below). The younger cohort, ages 18 to 24, was more likely to live with parents in 1990, when more than half of these adults lived with parents, than in the early 2000s. However, by 2006 this share exceeded 50 percent again and grew to more than 57 percent in 2012. Rising college enrollment among younger adults ages 18 to 24 helps explain their increased preferences for not leaving parental homes. The majority of adults in this age group, 52 percent, attended school or college in 2012, compared to 45 percent in 2000 and 43 percent in 1990. College attendance plays a less important role in the decision of older adults, ages 25 to 34, to stay at parents’ home. Less than 14 percent of adults in this older cohort were still in college or school in 2012, the comparable share in 1990 and 2000 was just slightly below, close to 12 percent. For older, more experienced and better educated adults ages 25 to 34, the ability to find stable, higher-paying jobs plays an increasing role. 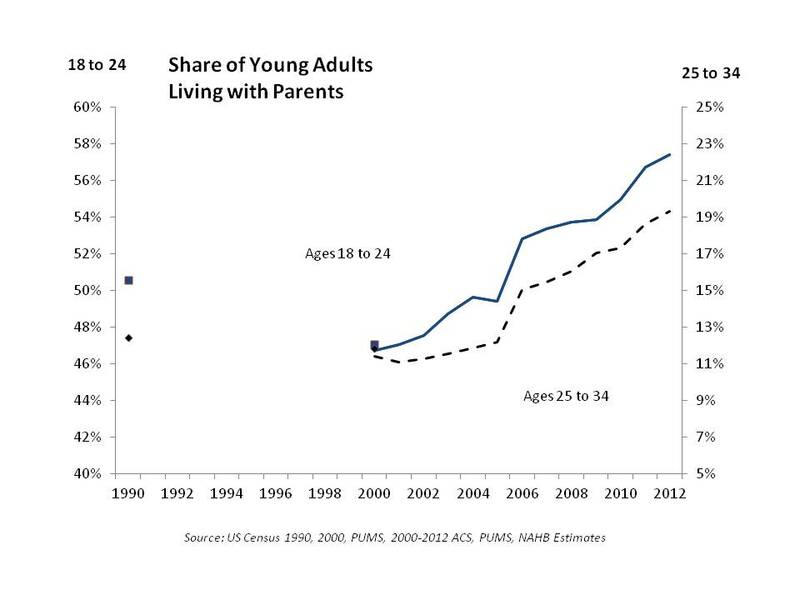 As unemployment rates kept increasing in the late 2000s so did the shares of young adults living with parents. In 2000, the shares of unemployed in this age group were 7 percent among young adults living with parents and 4 percent among those living independently. By 2012, these shares reached 14 percent among adults living with parents and 6 percent among same age adults living independently. The NAHB report also analyzes state unemployment rates and finds that, on average, states with larger increases in unemployment rates among young adults registered larger gains in percent of young adults living with parents. Even though unemployment rates started to decline in most states in 2011, shares of young adults living with parents remain stubbornly high and even increased in some states, suggesting that it takes longer for young adults to overcome the overall sense of economic instability, gain confidence and financial independence before leaving parents’ homes. This is particularly true for states hardest hit by the housing boom and bust, such as California and Florida, where percent of young adults living with parents continued to rise through 2012 despite improving job markets. As of 2012, three Northeast states – New Jersey, Connecticut, and New York – register the nation’s highest shares of young adults ages 18 to 34 living with parents or parents-in-law – 45, 42 and 41 percent, respectively (see the map above). California and Florida – two of the states hardest hit by the housing boom and bust – follow with their shares just slightly under 40 percent. At the opposite end of the spectrum are the District of Columbia known for its relatively stable job market and North Dakota known for its oil booming economy – both registering shares under 20 percent. Young adults ages 25 to 34 traditionally represent about half of all first-time home buyers. Their delayed willingness and ability to leave parental homes and strike out on their own undoubtedly contributed to suppressing housing demand further during the Great Recession. Declining shares of young adults living with parents in some states – Rhode Island, Montana, Wyoming, Maine, Delaware and New Mexico among others – could be one of the early signs that pent-up housing demand may finally start turning into realized housing demand. A component of pent-up housing demand is the situation of collapsed households — individuals who reside with another household. From a data perspective, we can identify some of these households by estimating the number of housing units that contain individuals who are not related to each other. This is just a part of pent-up demand of course, as it excludes adult children who live with parents or other relatives. NAHB has previously estimated that pent-up housing demand totals about 2.1 million potential households. The Census Bureau calculated a similar number, reaching 1.9 million households who are “doubled up.” And a recent Federal Reserve Bank of Cleveland study puts the number at 2.6 million potential households. 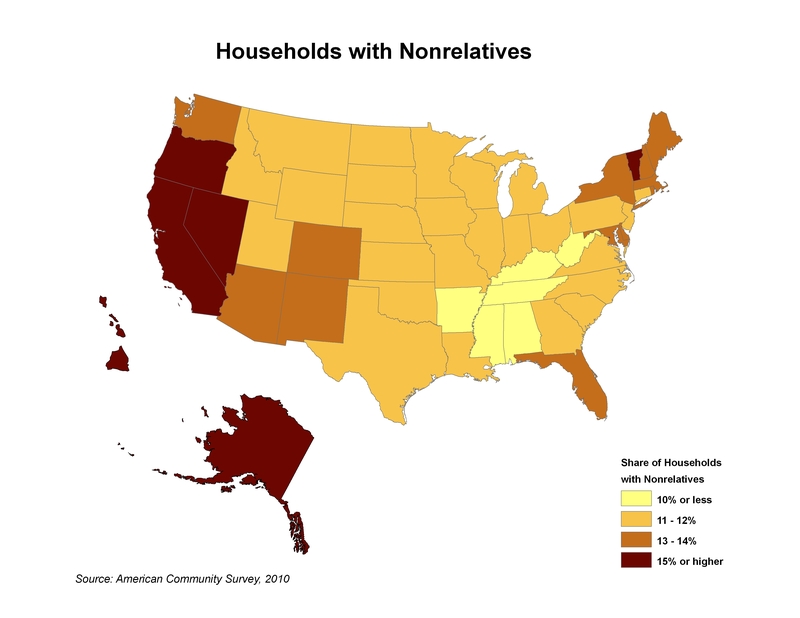 Data from the 2010 American Community Survey allow us to map the geographic distribution of the households with nonrelatives. The shares of such households are highest in states along the coasts and lowest in the South. The state with the highest share is Nevada, at 16.4%, followed by Hawaii( 15.5%) and California (15.3%). The state with the lowest share is Alabama at 8.8%, with both Mississippi (9.8%) and Arkansas (9.8%) at less than 10%. While these data are likely influenced by recent events in the housing markets, they also reflect cultural differences among the states. Households with nonrelatives includes homes occupied by the decidedly unromantic classification of “cohabitating partners.” This may be a more common practice along the West Coast and the Northeast than in parts of the South. Excluding such couples, yields “shared households,” but unfortunately the ACS data do not allow an easy mapping of that population group, which has been growing as a direct result of the Great Recession. In January, Eye on Housing took a look at the age of the housing stock. In that analysis, we found that according to the 2009 American Housing Survey (AHS), the median age of owner-occupied homes in the United States is 34 years old, 11 years older than the median age found in the 1985 AHS. So it is clear that the U.S. housing stock is aging. And older homes are typically more expensive to maintain. 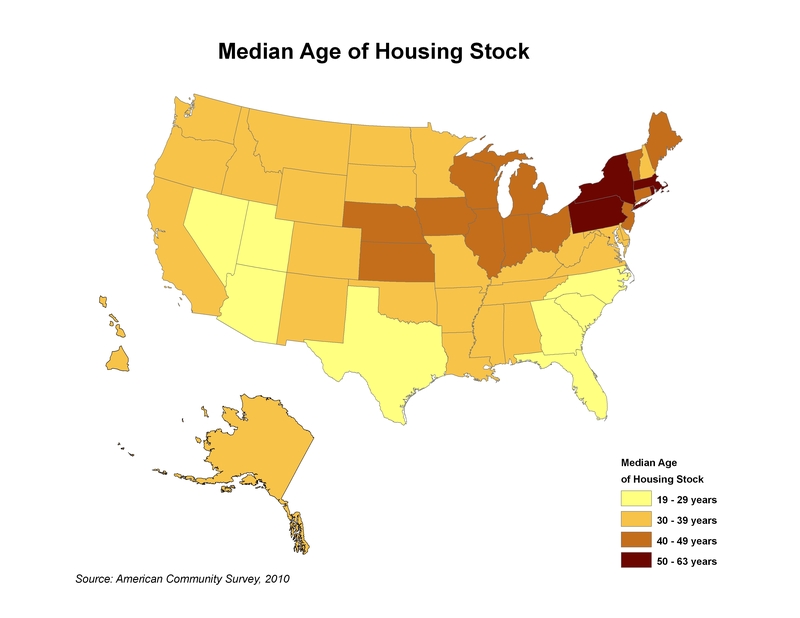 Using data from the 2010 American Community Survey, the geographic distribution of the median age of the entire housing stock (owned and rented) can be presented. And clear regional clustering can be seen. For the typical housing unit, the oldest homes are found in the Northeast. With the exception of the District of Columbia (median age of 63, but not a good geographic comparison with states consisting of both urban and rural areas), the state with the highest median age is New York, at 57 years. Rhode Island is next at 56. The youngest housing is present in the southern parts of the nation, where population growth has been the highest in recent decades. An almost identical map portrays the share of the housing stock built before 1970. Again, New York tops the lists of states, with almost 70% of its housing stock having been built before 1970. Rhode Island (65%) and Massachusetts (63%) round out the top three. Again, D.C. ranks higher than any state, with 78% of its housing stock having been built before 1970. The contrast in shares is strong between states. Among states with younger housing stocks, Nevada (11%) and Arizona (17%) have the smallest shares of their housing stocks having been built before 1970. This information is clearly important for housing demand, as areas with aging housing stocks have higher demand for both remodeling and replacement housing construction. But on the other hand, the geographic distribution of the age of the housing stock reflects the movement of population within the United States in recent decades. 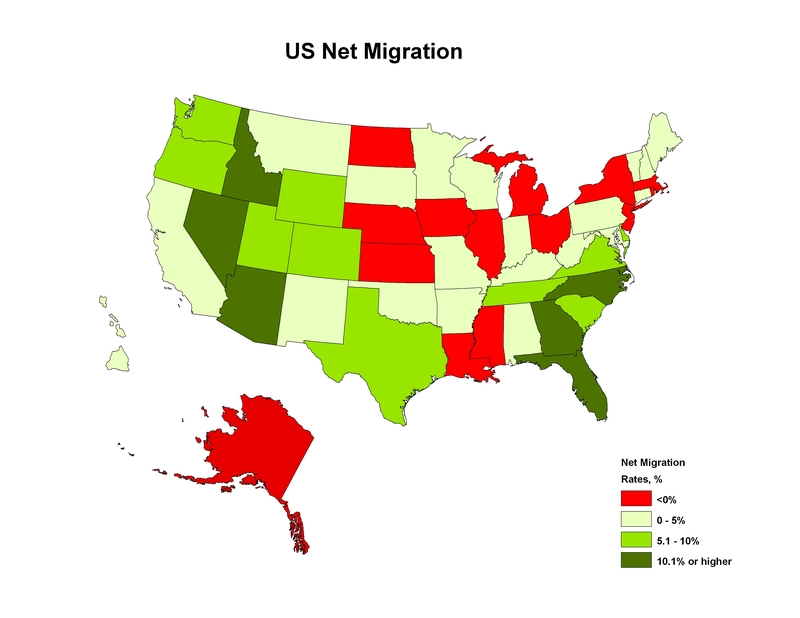 The following map shows net migration (state-to-state, as well as international) from 2000 to 2010, with the states in red losing population. It’s clear that there is a significant correlation between net migration patterns and the age of the housing stock. And areas with higher population growth have greater demand for home building.